I've got a recipe to spice up your day, whether you're in a sunshine state or watching the snow fall (like I am). I thought it was supposed to be spring....just saying. Any who, husband and I tried this recipe out last week as our Meatless Monday meal, because yes, we are still sticking to our themed eating! And we were both pleasantly surprised with its delicious taste and filling qualities. Paired with some tortilla chips, salsa, and guacamole, you've got a healthy meal sure to please your taste palette. Preheat the oven to 375° and line a rimmed baking sheet with aluminum foil. In a saucepan, heat the olive oil, onion, and carrot until the vegetables have softened and the onion becomes translucent. Add the minced garlic and cook for about 2 more minutes. Next add the quinoa, 1.5 cups of water, and the salt. After the water comes to a boil, reduce the heat to low and cover the saucepan, allowing it to simmer for 20 minutes or until all the liquid as been absorbed. 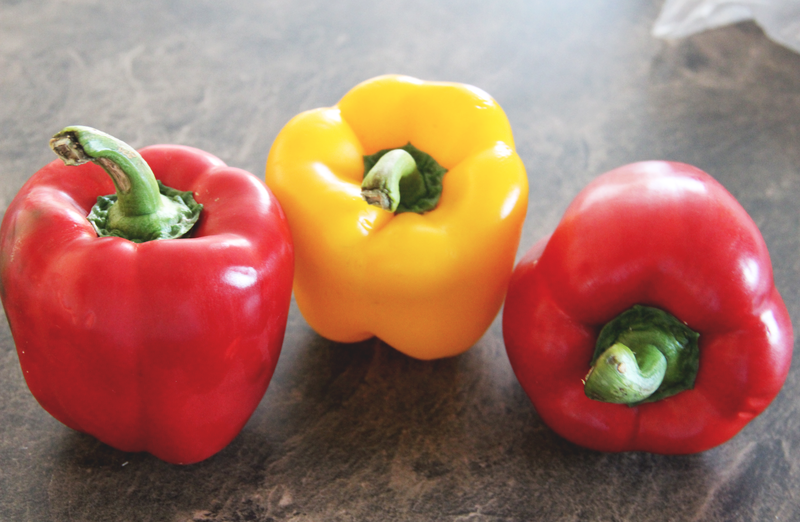 In the meantime, get the peppers ready by washing them, cutting each one in half, from top to bottom, and removing the stem, seeds, and membranes. 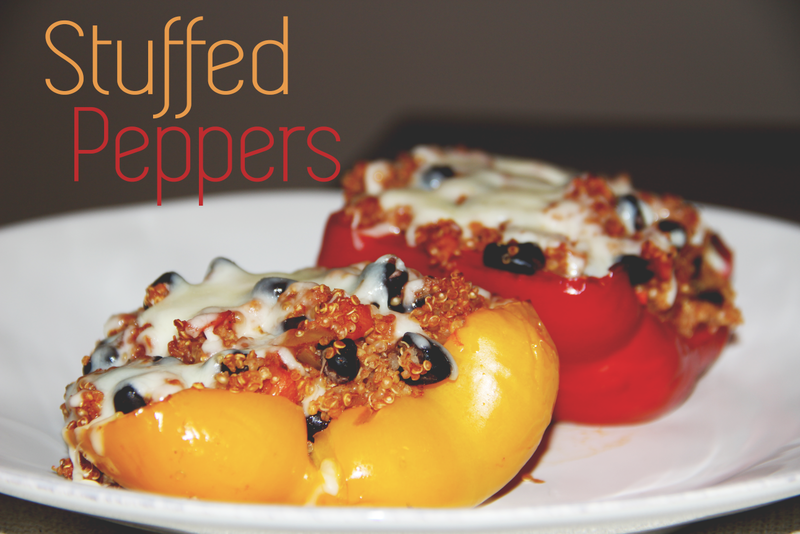 Arrange the peppers, cut-side up, on the baking sheet and coat in baking spray. 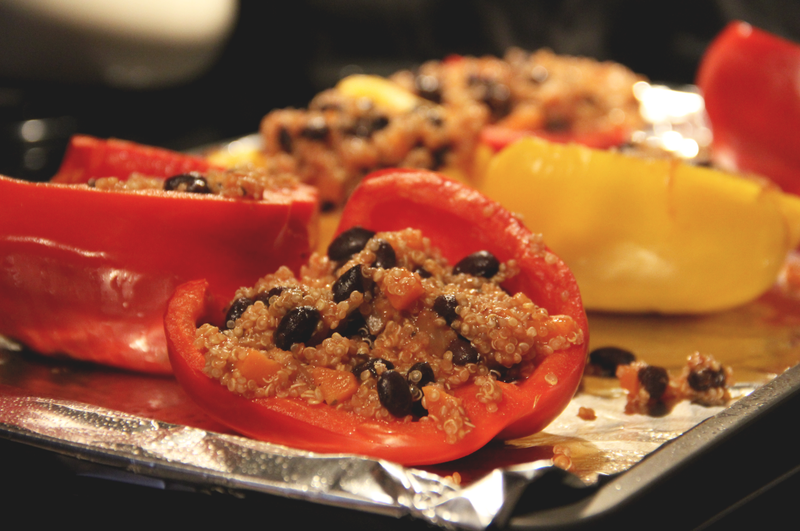 Bake the peppers for 15 minutes and then remove them from the oven. Back to the sauce: once the liquid as been absorbed, add the black beans, tomato sauce, and all the spices. Mix thoroughly and then divide the quinoa mixture amongst the 6 pepper halves. Pat down the filling in order to pack it in. Bake the stuffed peppers for 20 minutes and then top them with your desired cheese and amount, putting them back in the oven until the cheese has melted.